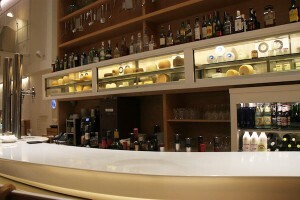 A sampling of cheeses on display in the Poncelet Cheese Bar in Madrid. • Poncelet Cheese Bar, Calle de Jose Abascal, 61, is a relatively new establishment in a sleekly designed open interior space. 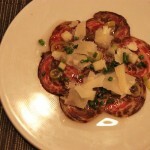 A wide variety of foods are prepared with cheese. Scores of cheeses are offered on a multipage menu, as well. We sampled several dishes, which included mushroom risotto, cod and pork, all with cheese as an ingredient. Of course, end-of-meal cheeses were offered, too. • Teatriz Restaurant, Calle de Hermosilla, 15, is in an old theater repurposed as an eatery, with designs by Philippe Starck. It was a fun place to look at, especially as the theater’s spaces were preserved. We were on the stage, which was a more casual setting than the area where an audience would have sat. We overlooked that audience space where tables looked more formal with white tablecloths, much like a club where people would come to eat, drink and watch a show. On the stage beside us was a long bar with enticing food displays. We could also see what must have been balcony seating where a number of guests appeared to be partying around a piano. 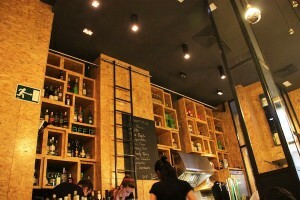 High-ceilinged interior of the Vi Cool tapas restaurant in Madrid, facing the service area. I looked at online reviews praising this Italian restaurant, but we did not find the food matched the decor. I certainly did not regret the experience, however. 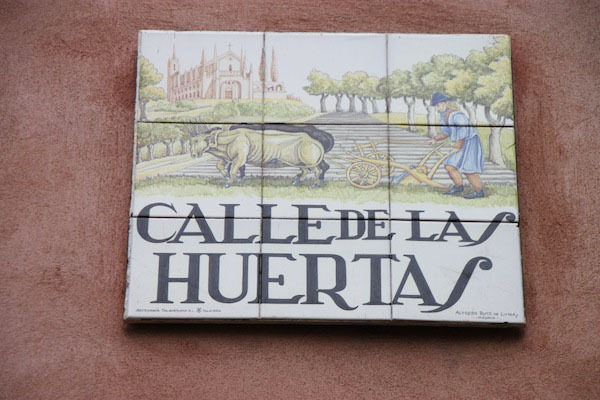 One of Madrid’s many charming painted-tile street signs, in this case, signifying the street where the Vi Cool restaurant is found. 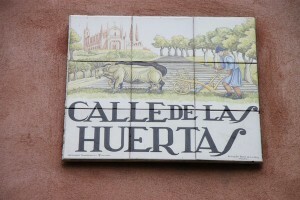 de las Huertas, 12, in Madrid’s Literary Quarter, and my favorite of these spots. The quarter is an artsy neighborhood that extends on one side to the Prado Museum. In the opposite direction, the quarter abuts Madrid’s historic core, which dates from the ninth century when the Moors founded the city. Tapas of pork sausage in sherry, with onion, peppers and cheese, served at Vi Cool in Madrid. nifty way to sample what a restaurant offers. And we tasted about a dozen items over a period of at least two hours, walking out around 4 p.m. These nibbles included pork sausage slices in sherry, onion, peppers and cheese; scallops tartar, eaten wrapped in lettuce; chicken and pork cannelloni (really good!! ), and ricotta mousse with berries and honey, which was exceptional, too. 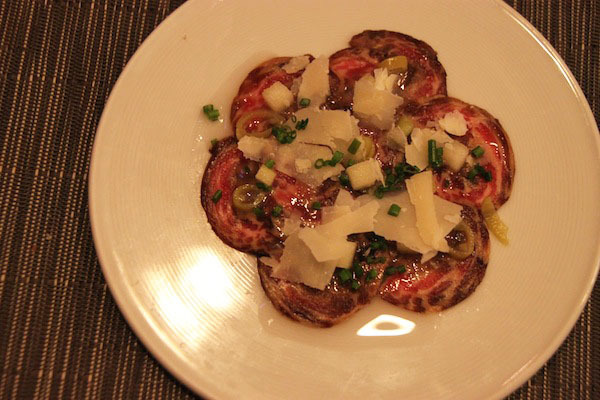 Center city areas — and no doubt much of Madrid — are awash in tapas eateries — including options in the San Miguel Market. To my regret, I wasn’t in town long enough to make a dent in this subject. 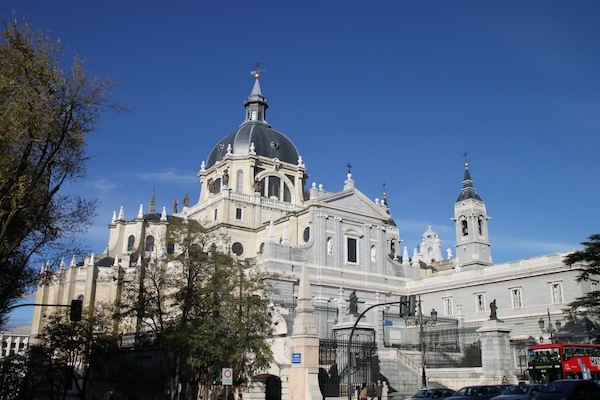 The Almudena Cathedral in the historic center of Madrid.